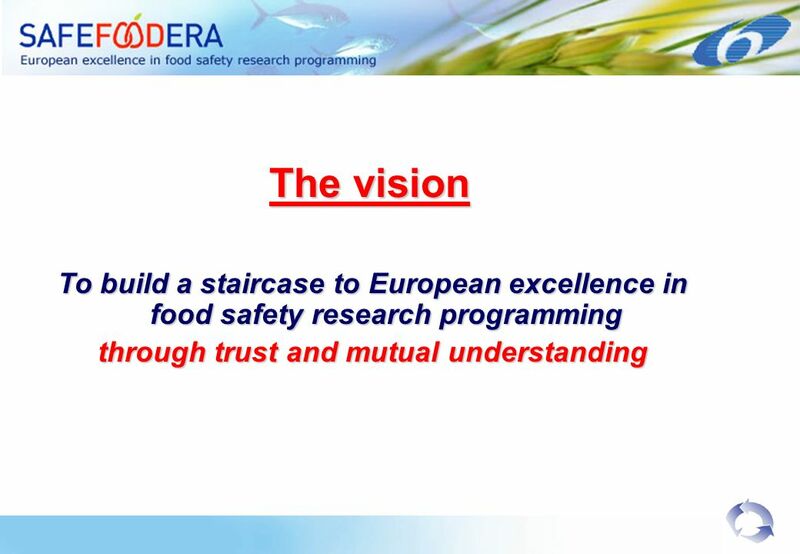 The vision To build a staircase to European excellence in food safety research programming through trust and mutual understanding. 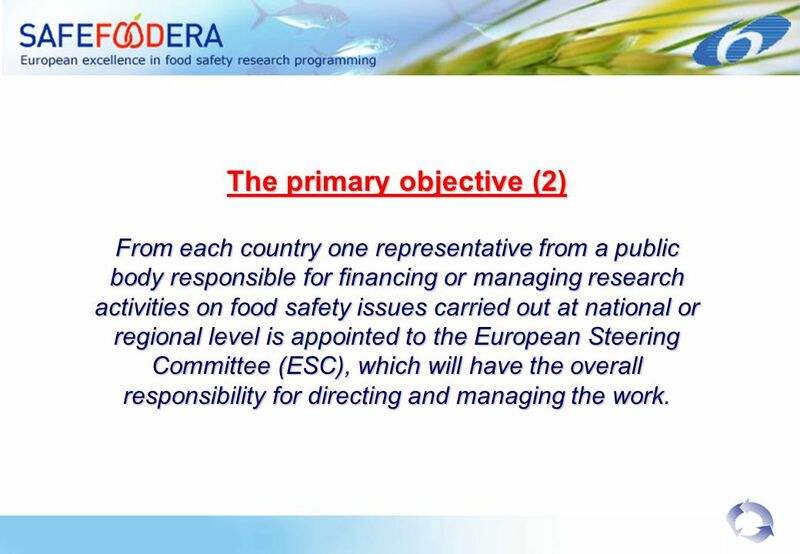 8 The primary objective (2) From each country one representative from a public body responsible for financing or managing research activities on food safety issues carried out at national or regional level is appointed to the European Steering Committee (ESC), which will have the overall responsibility for directing and managing the work. 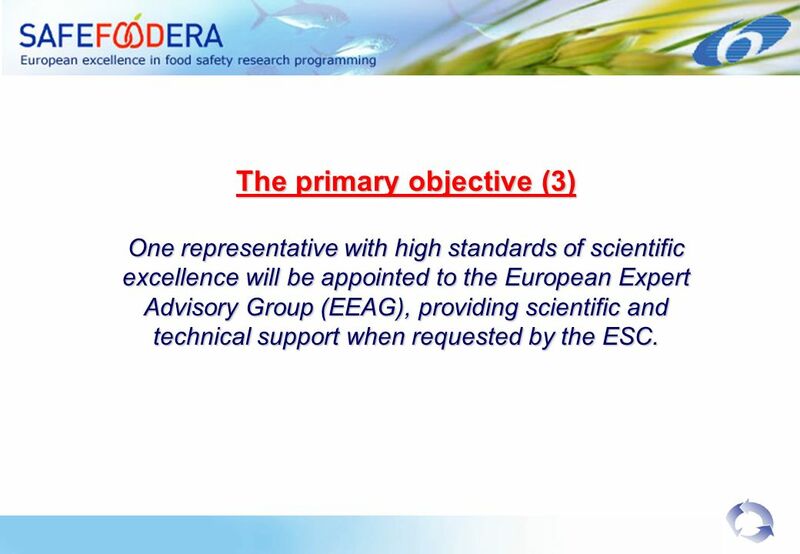 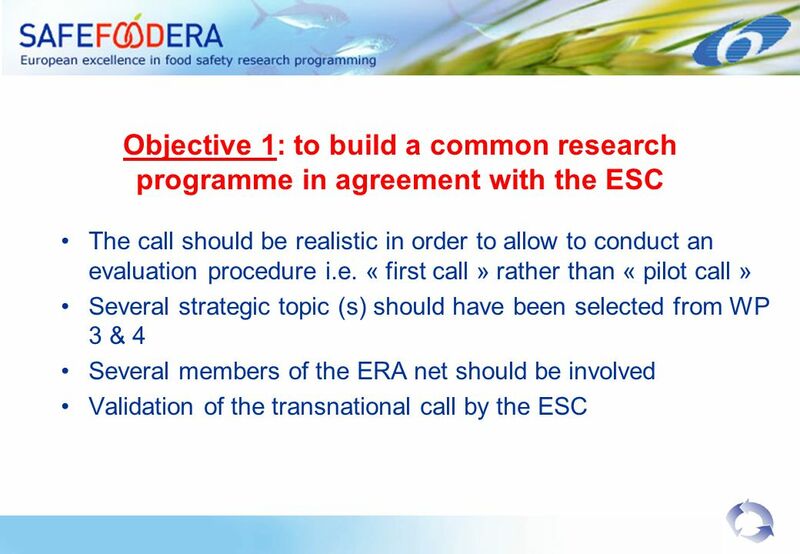 9 The primary objective (3) One representative with high standards of scientific excellence will be appointed to the European Expert Advisory Group (EEAG), providing scientific and technical support when requested by the ESC. 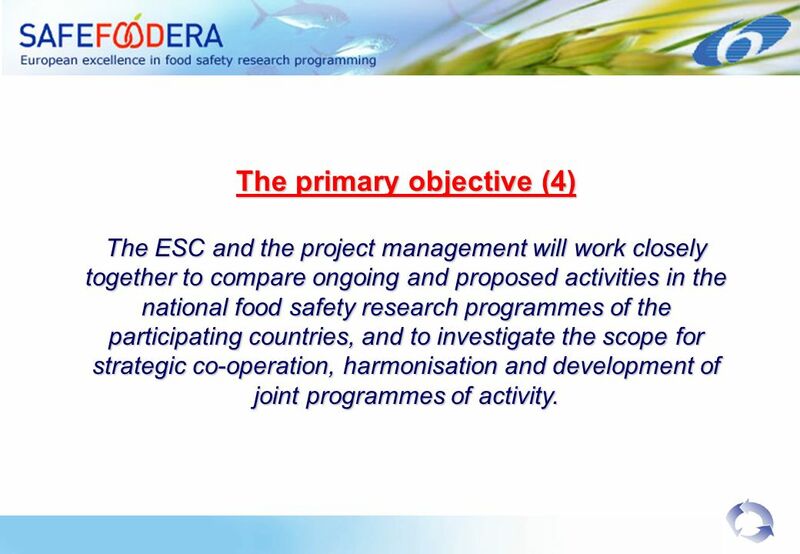 10 The primary objective (4) The ESC and the project management will work closely together to compare ongoing and proposed activities in the national food safety research programmes of the participating countries, and to investigate the scope for strategic co-operation, harmonisation and development of joint programmes of activity. 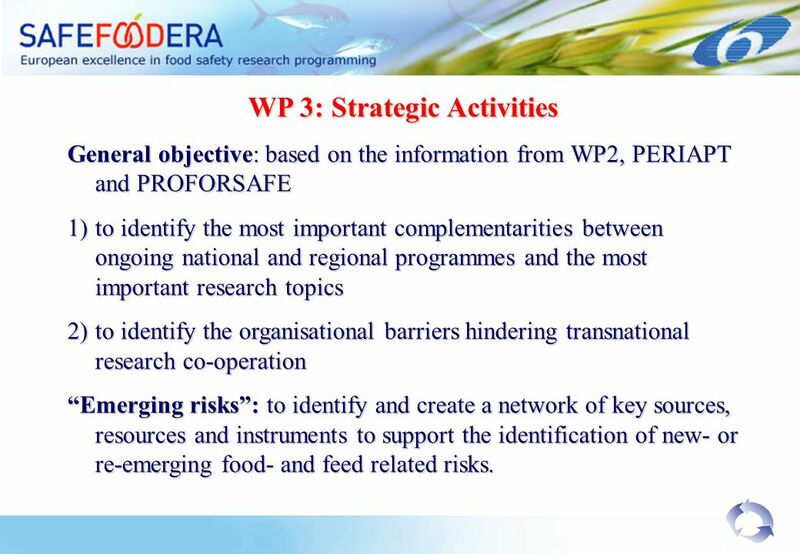 28 WP 3: Strategic Activities General objective: based on the information from WP2, PERIAPT and PROFORSAFE 1)to identify the most important complementarities between ongoing national and regional programmes and the most important research topics 2)to identify the organisational barriers hindering transnational research co-operation Emerging risks: to identify and create a network of key sources, resources and instruments to support the identification of new- or re-emerging food- and feed related risks. 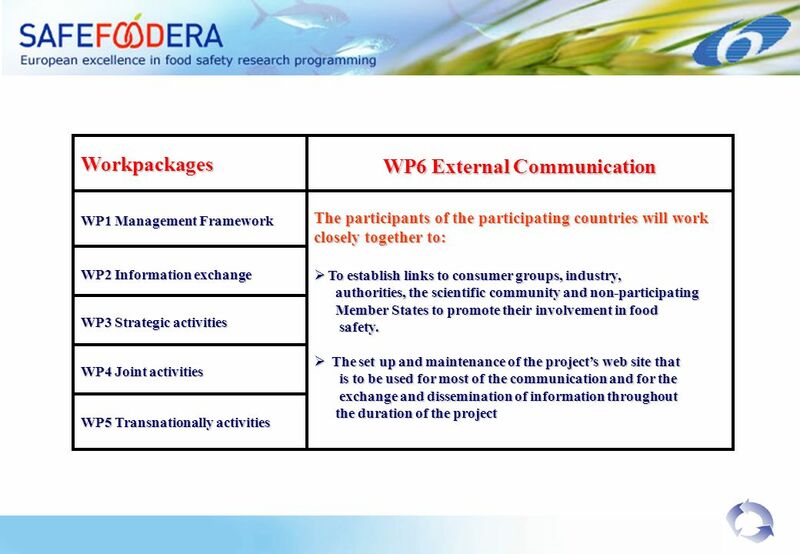 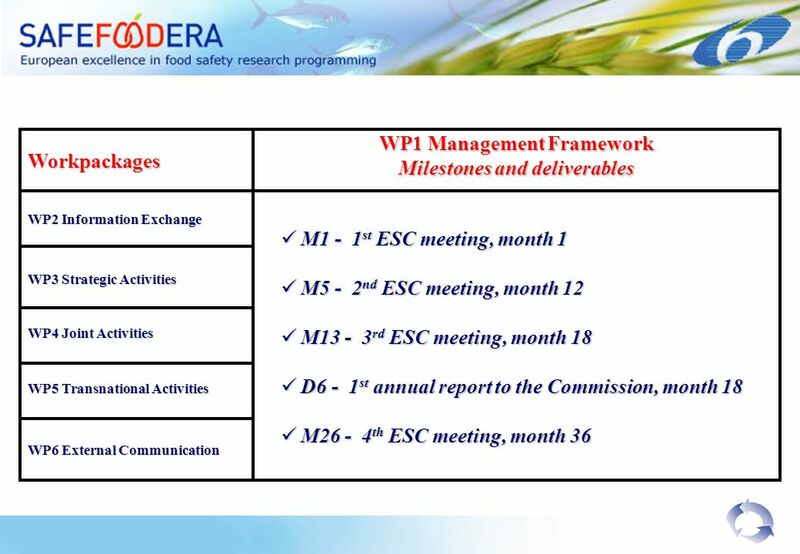 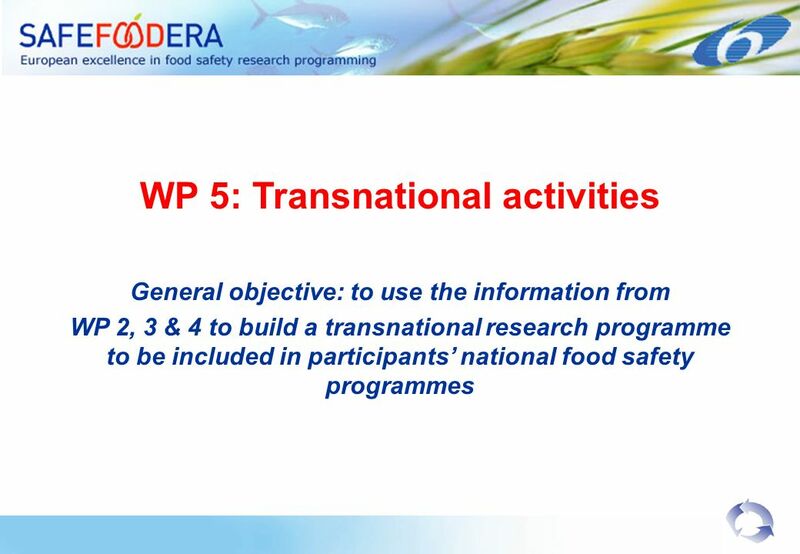 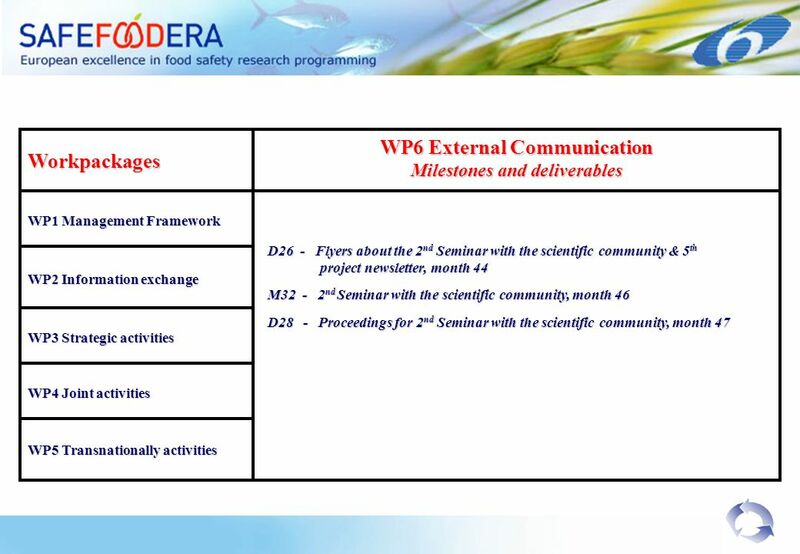 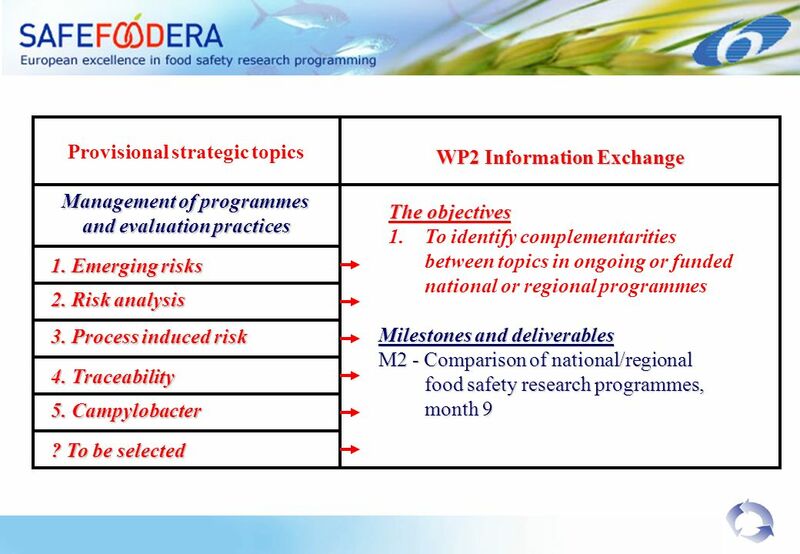 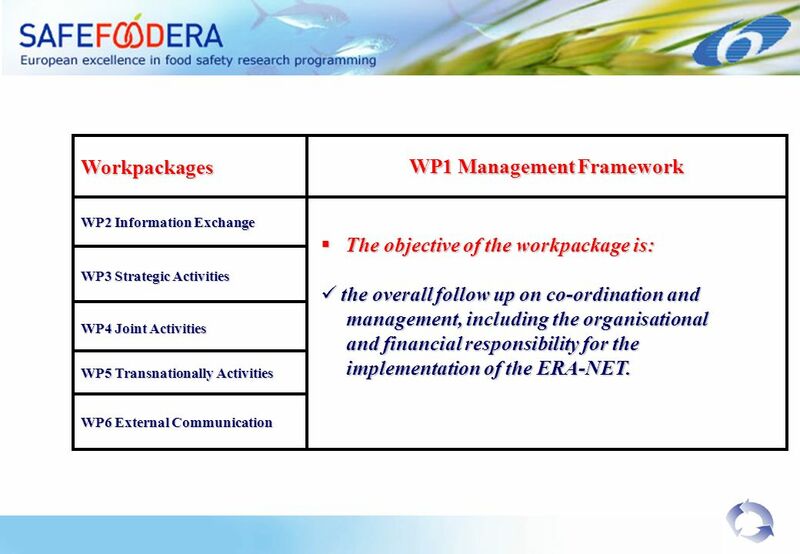 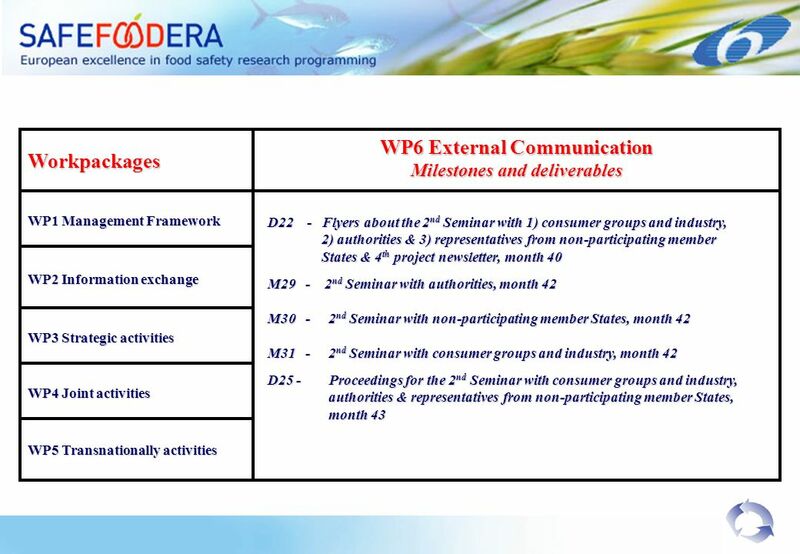 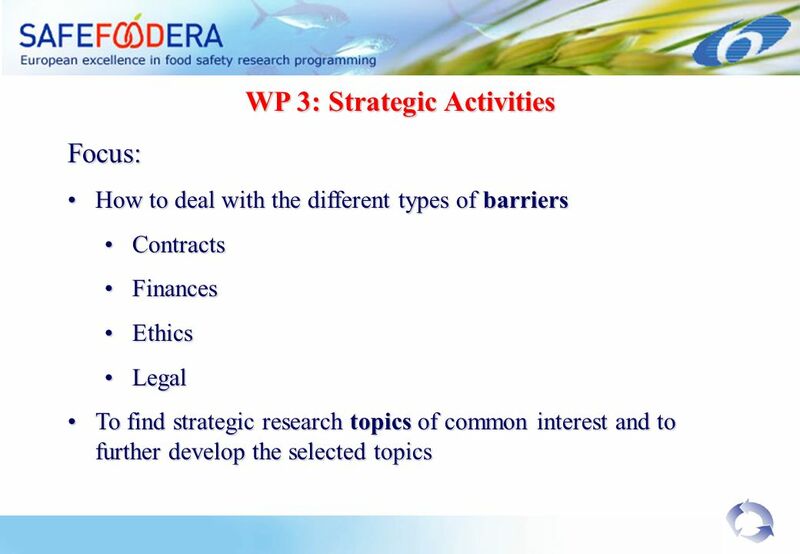 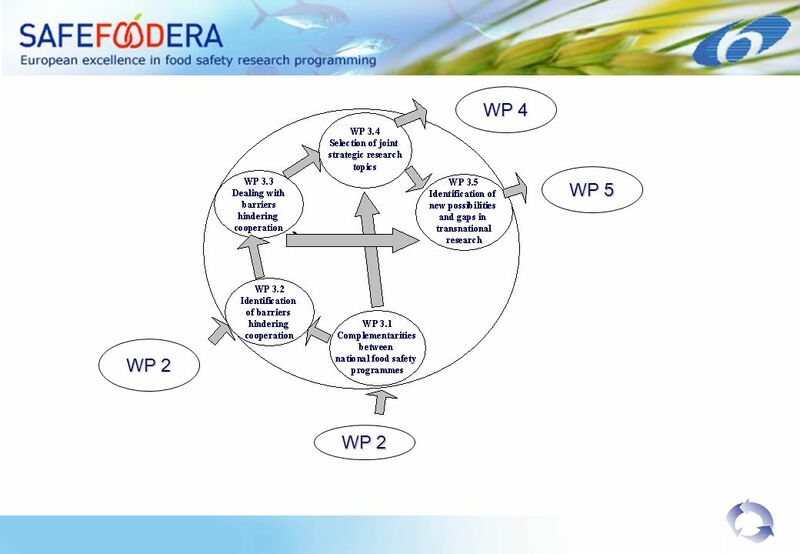 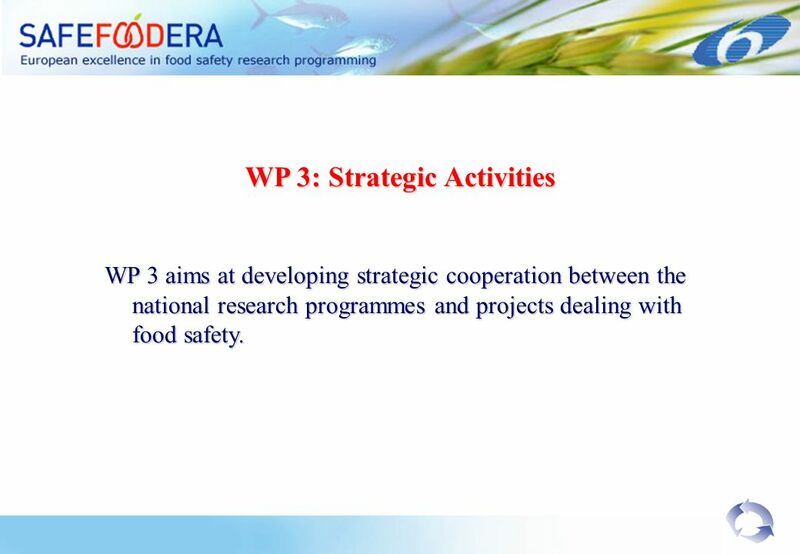 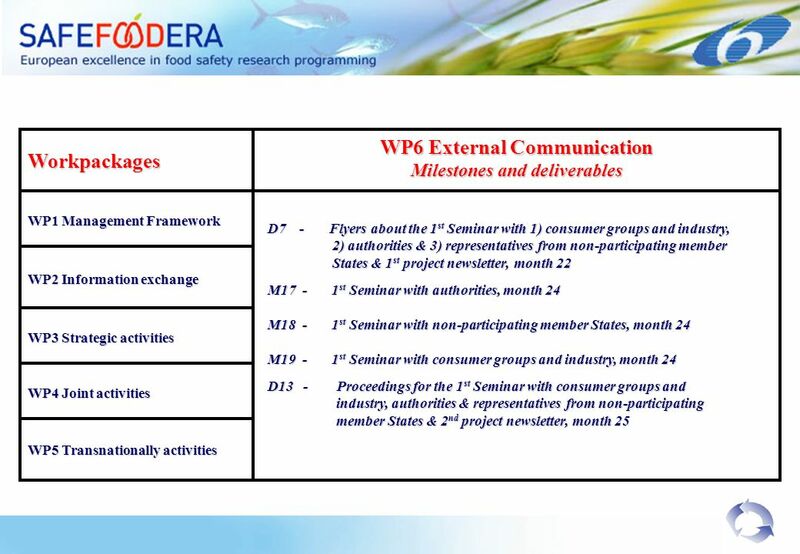 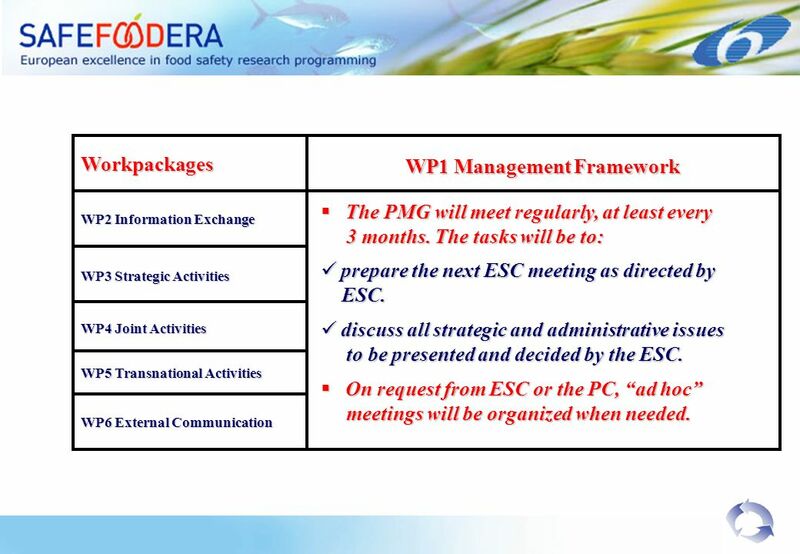 29 WP 3: Strategic Activities WP 3 aims at developing strategic cooperation between the national research programmes and projects dealing with food safety. 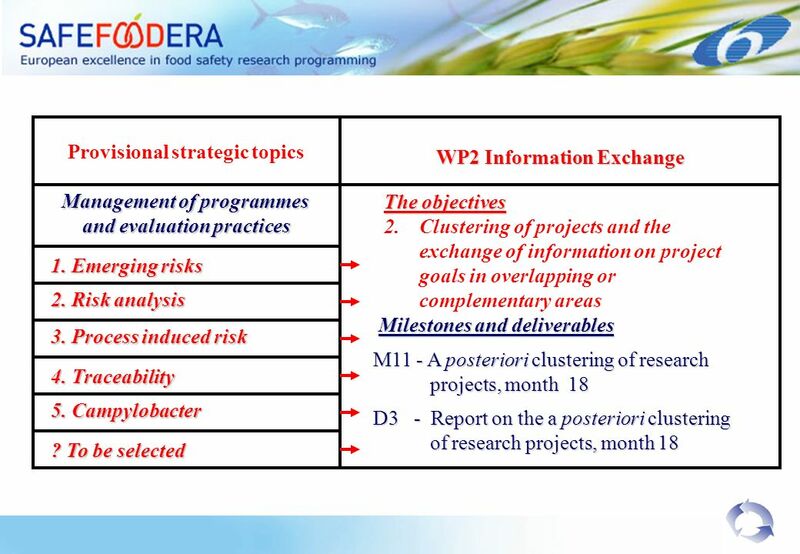 33 WP 3: Strategic Activities WP 4 & WP 5 are based on WP 3 Quality of information from all participating countries is highly important!!!!! 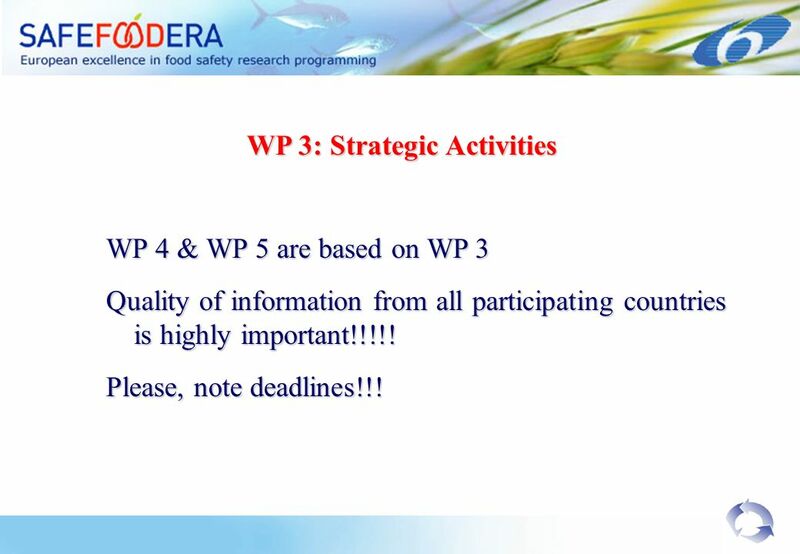 Please, note deadlines!!! 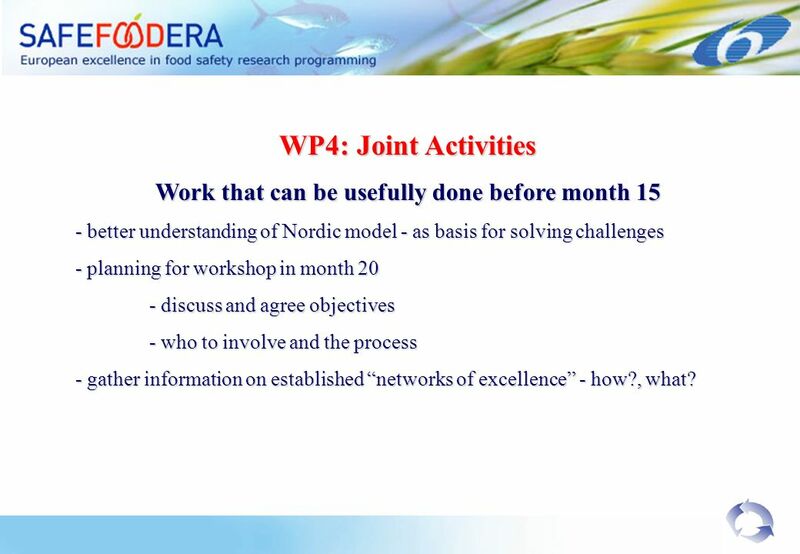 37 WP4: Joint Activities Work that can be usefully done before month 15 - better understanding of Nordic model - as basis for solving challenges - planning for workshop in month 20 - discuss and agree objectives - who to involve and the process - gather information on established networks of excellence - how?, what? 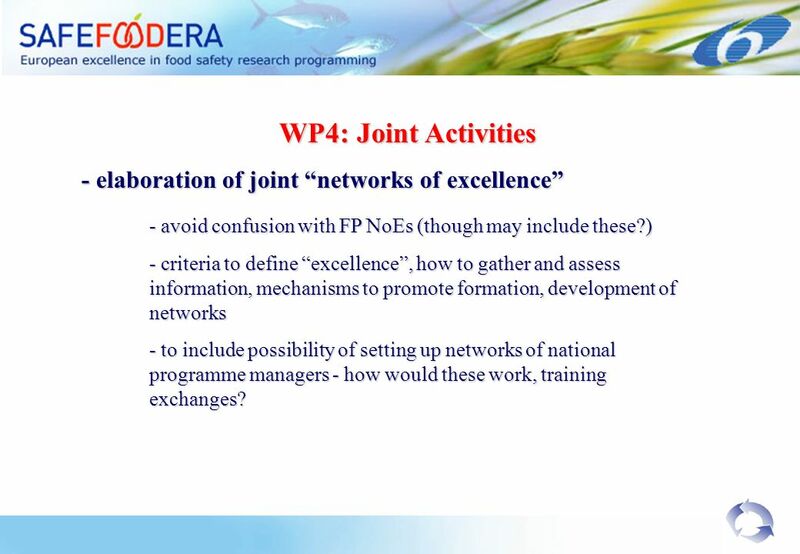 39 WP4: Joint Activities - elaboration of joint networks of excellence - elaboration of joint networks of excellence - avoid confusion with FP NoEs (though may include these?) 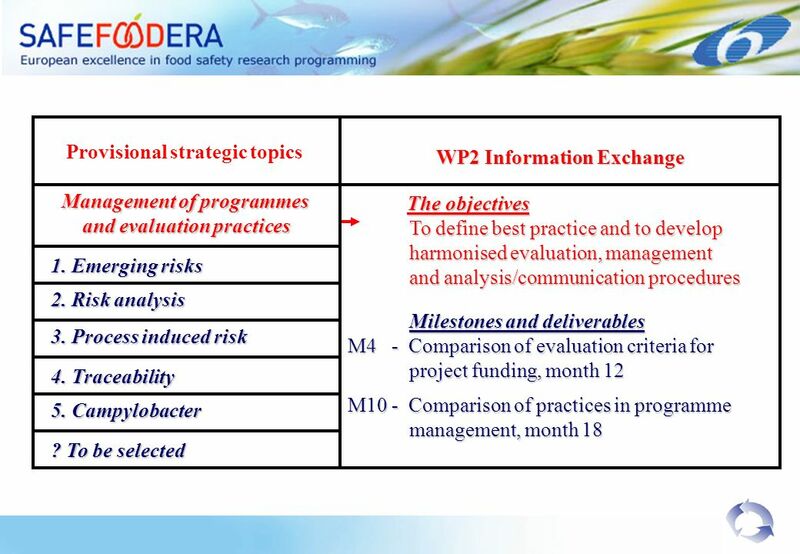 - criteria to define excellence, how to gather and assess information, mechanisms to promote formation, development of networks - to include possibility of setting up networks of national programme managers - how would these work, training exchanges? 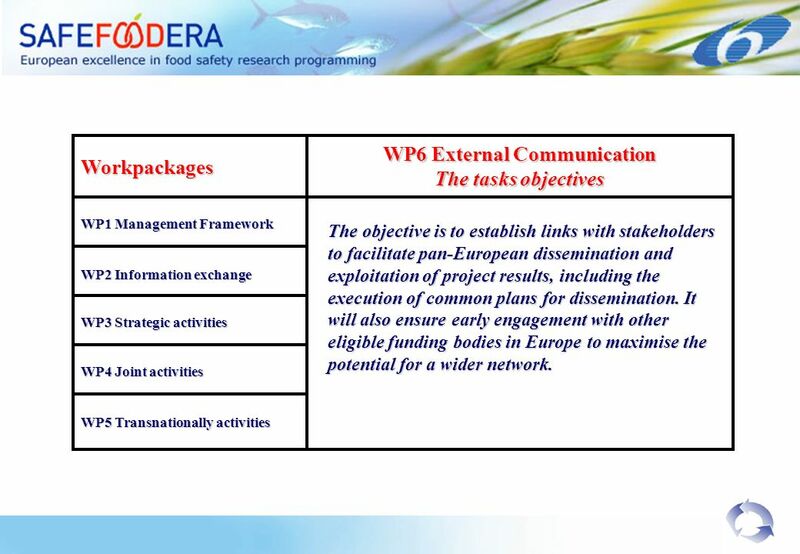 48 Objective 4: to disseminate efficiently the results of research funded Establishment of a procedure for the dissemination of results across countries –Scientific journal vs report –Paper vs web site –Workshops… Establishment of indicators of success to be used for objective 5 –Questionnaire for researchers –………..
52 Workpackages WP1 Management Framework WP6 External Communication The tasks objectives WP2 Information exchange WP3 Strategic activities WP4 Joint activities WP5 Transnationally activities The objective is to establish links with stakeholders to facilitate pan-European dissemination and exploitation of project results, including the execution of common plans for dissemination. 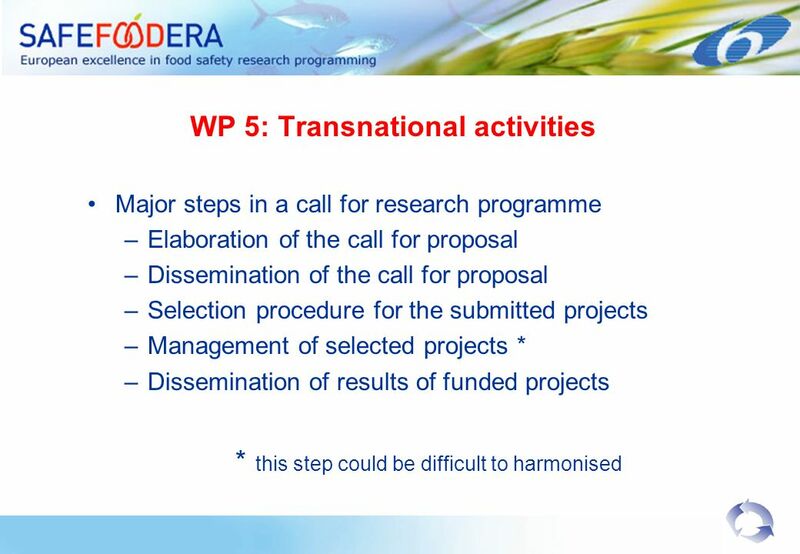 It will also ensure early engagement with other eligible funding bodies in Europe to maximise the potential for a wider network. 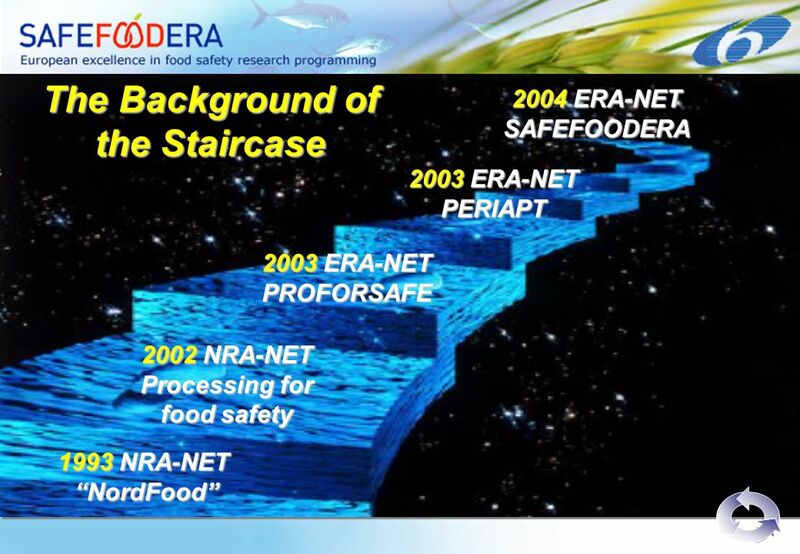 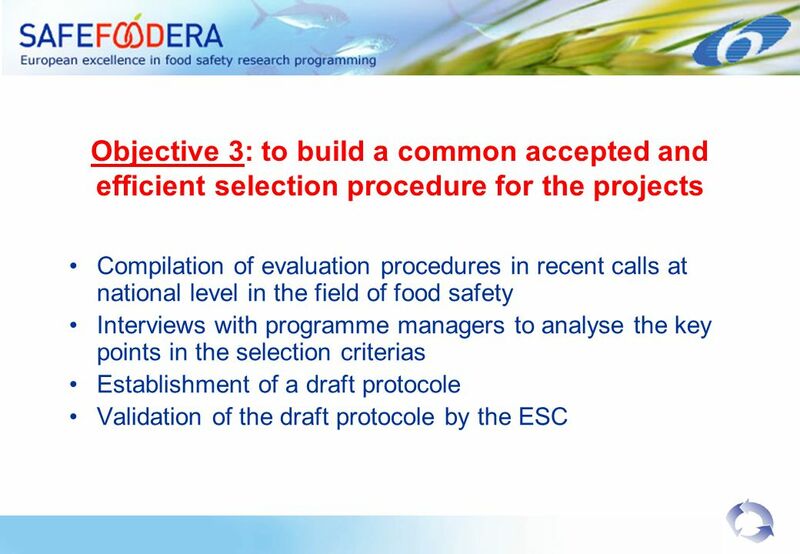 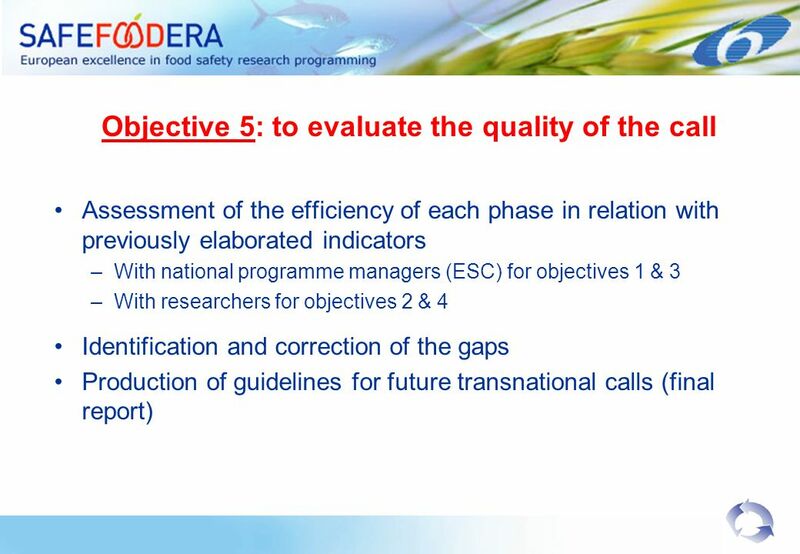 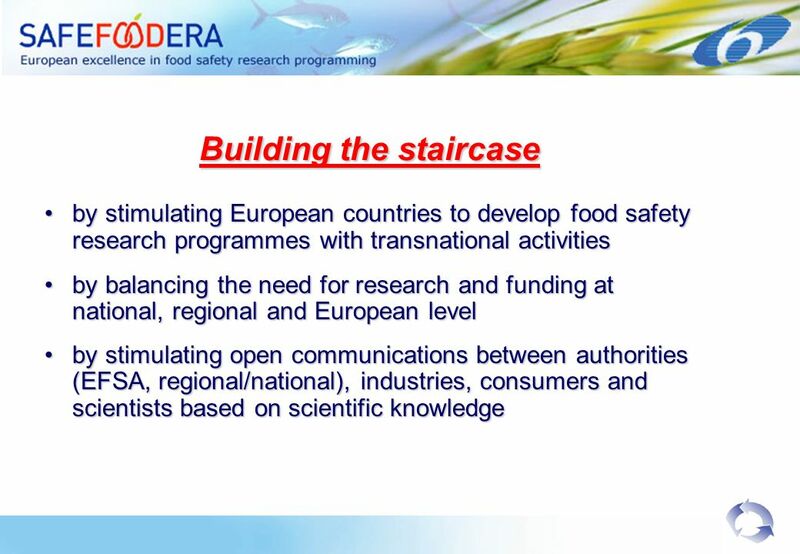 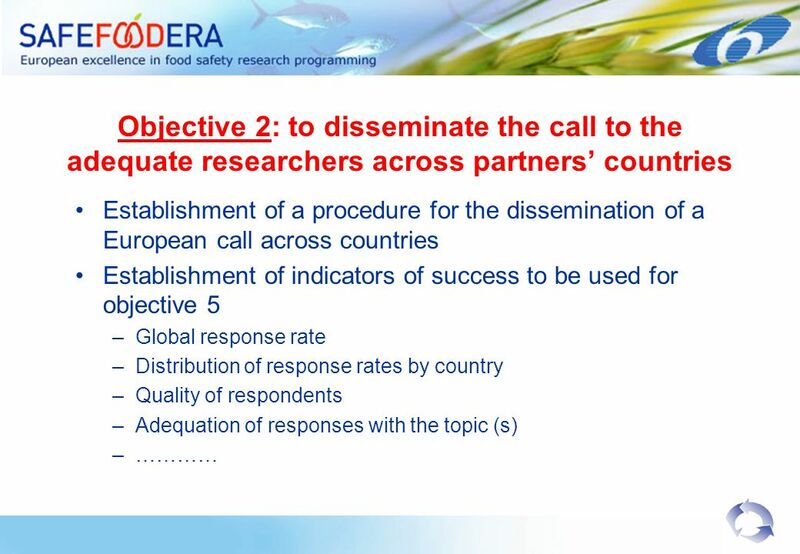 Download ppt "The vision To build a staircase to European excellence in food safety research programming through trust and mutual understanding." 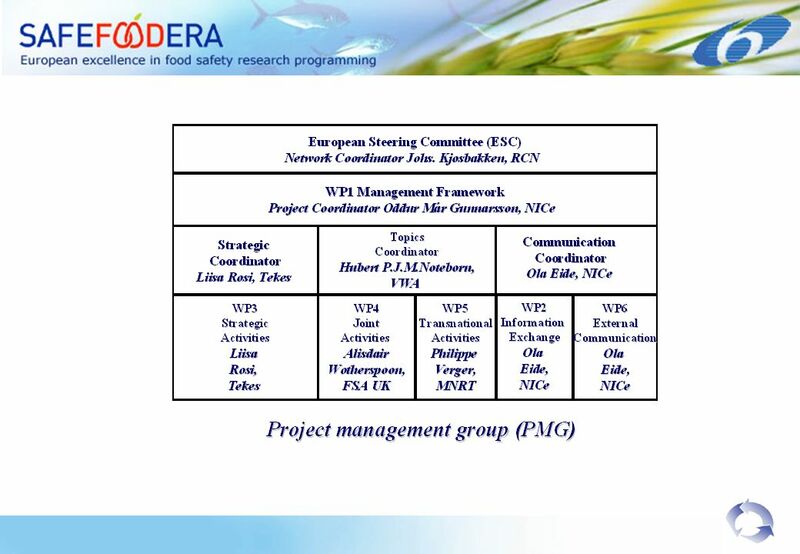 19 November 2004 PDS/1 6cp Workshop Programme of Work PASR-2005 Pieter De Smet. 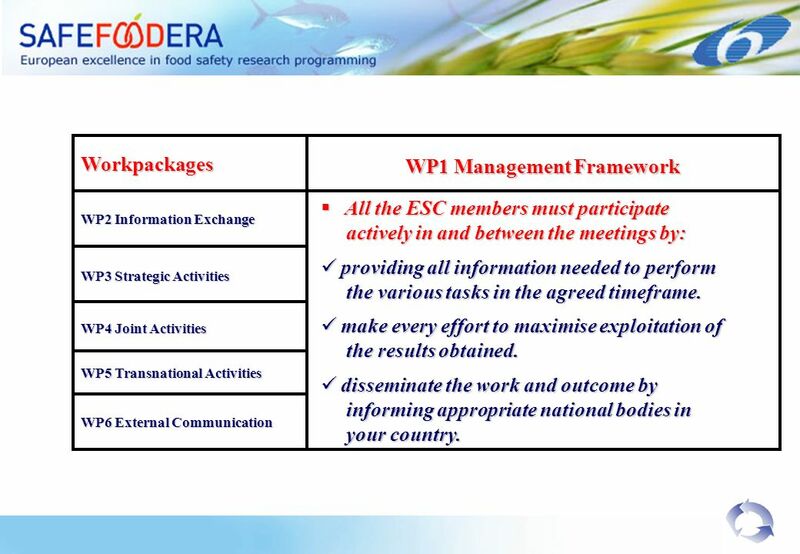 The White Paper – a policy paper to contribute to the integration process of the WBC in the ERA Dr. Erika Rost, Dr. Andreas Kahle Federal Ministry of Education. 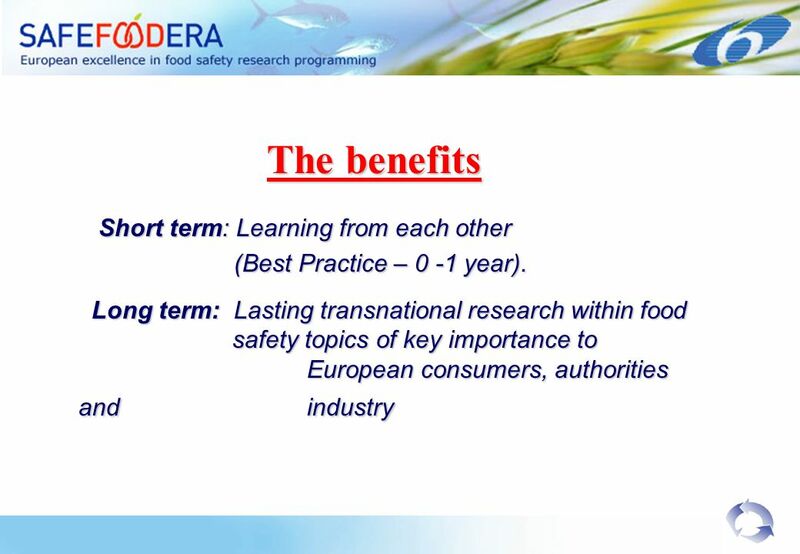 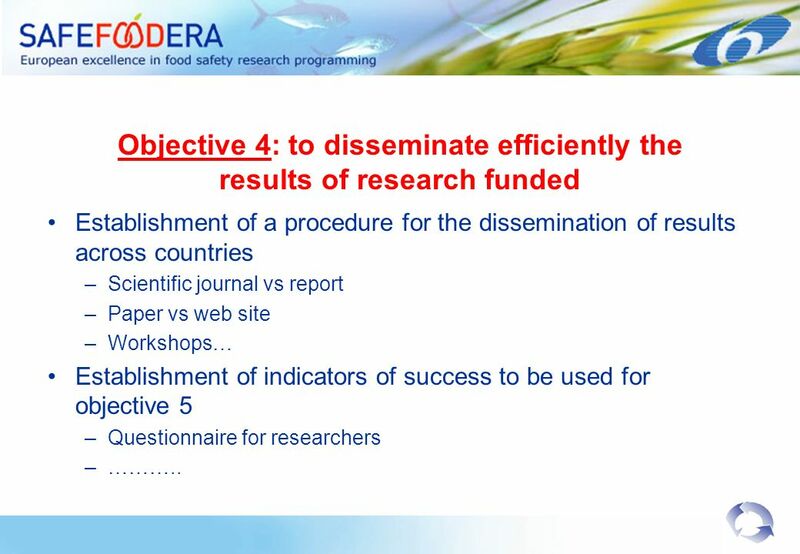 What Can SAFEFOODERA do for EFSA? 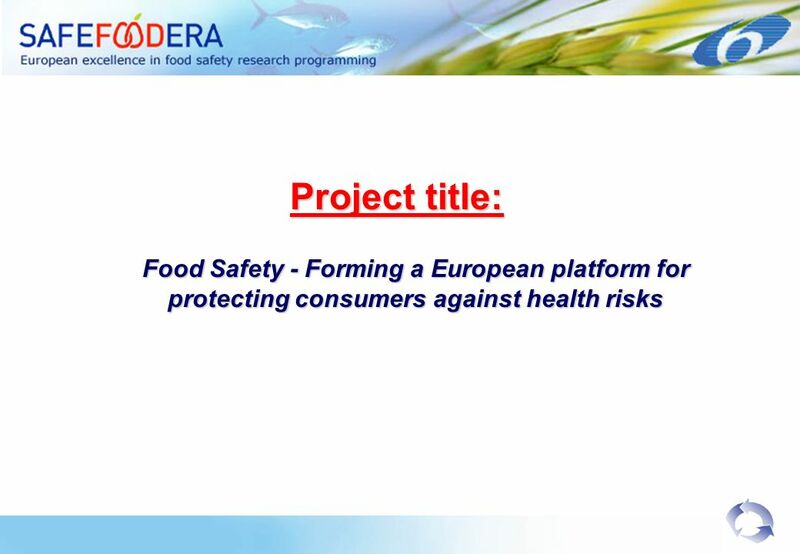 GEOFFREY PODGER Executive Director EFSA. SAFEFOODERA Stakeholder Group meeting with industry Copenhagen, December 2006. 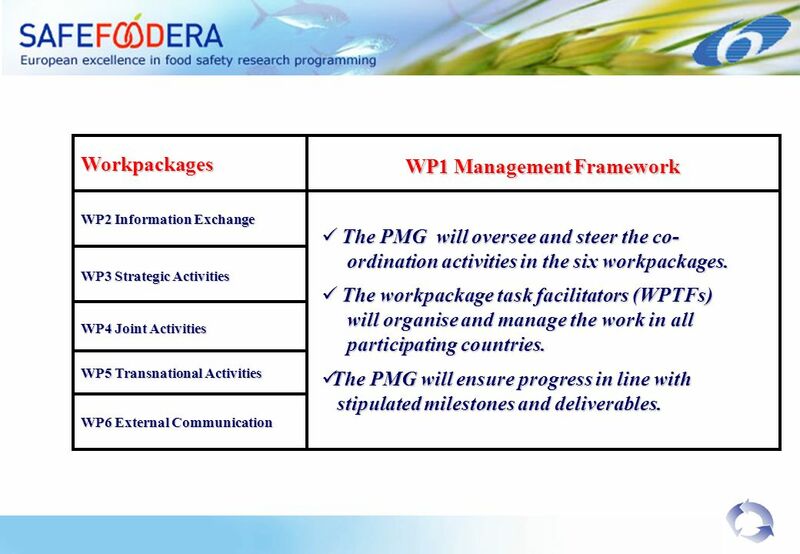 Coming together is a beginning. 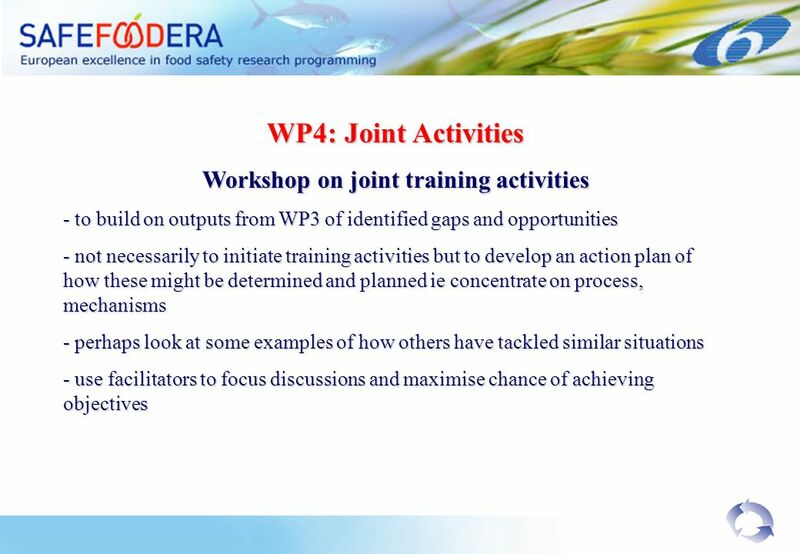 Keeping together is progress. 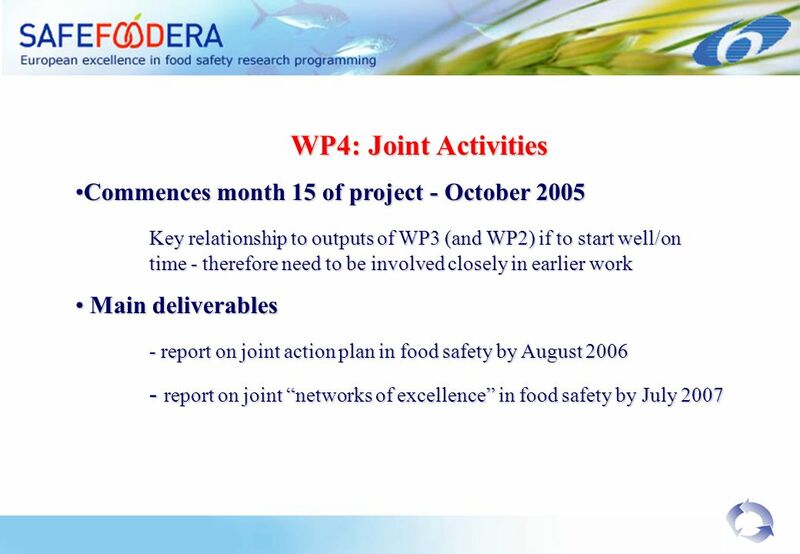 Keeping together is progress. 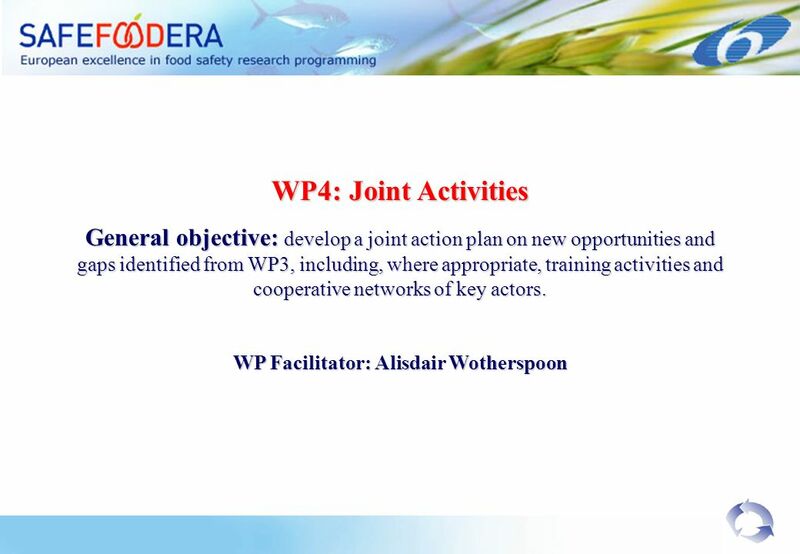 Working together is success Working. 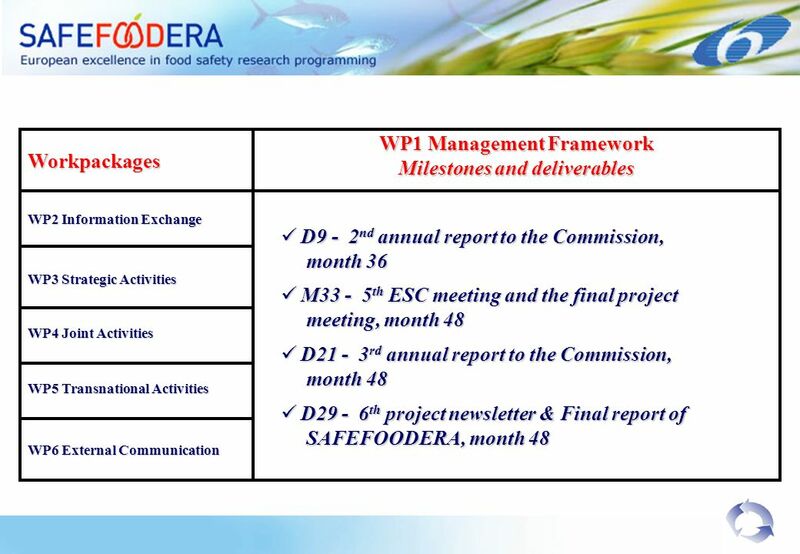 SAFEFOODERA WP6 - External communication Facilitating pan-European dissemination and exploitation of research results. 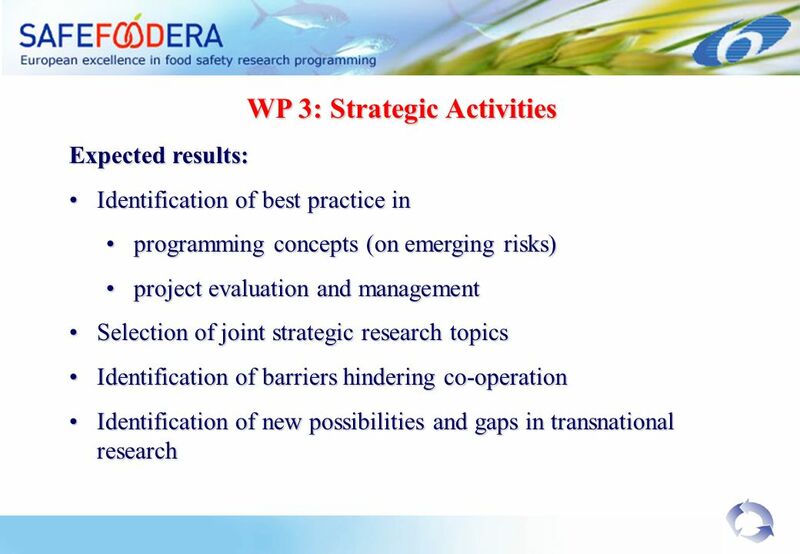 Status report. 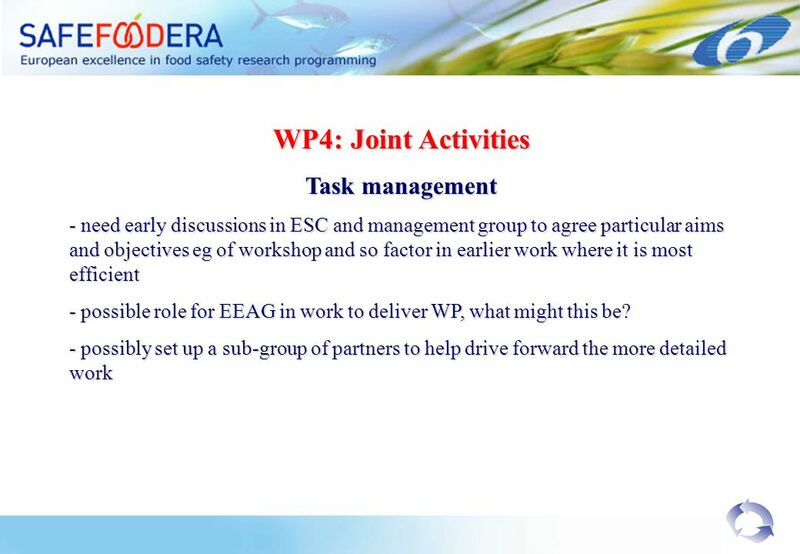 ESC meeting Den Haag September 2006 UPDATE: WORKSHOP - WP 4 - JOINT ACTIVITIES WP facilitator - Alisdair Wotherspoon, FSA UK. SAFEFOODERA – SSA – integration project Expansion of SAFEFOODERA – Fully integrated or Associated partnership in 12 months. 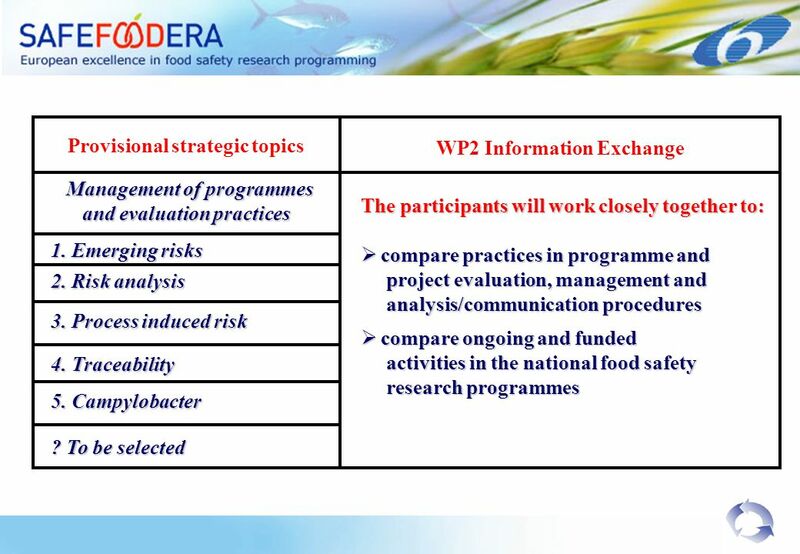 SAFEFOODERA The Nordic Model for Cooperation of National Food Safety Research Programs Coordinated by The Nordic InnovationCentre (NICe) Lisbon 23th November. 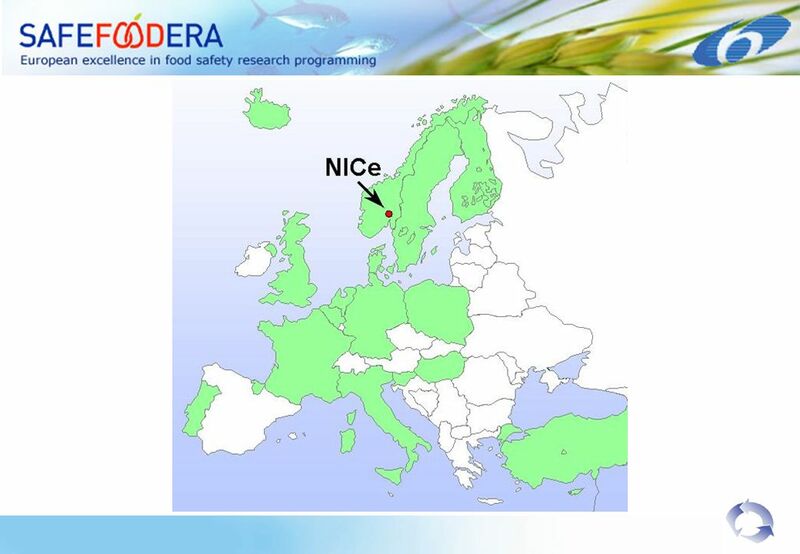 SAFEFOODERA The Nordic Model for Cooperation of National Food Safety Research Programs Coordinated by The Nordic InnovationCentre (NICe) Stakeholder meeting. 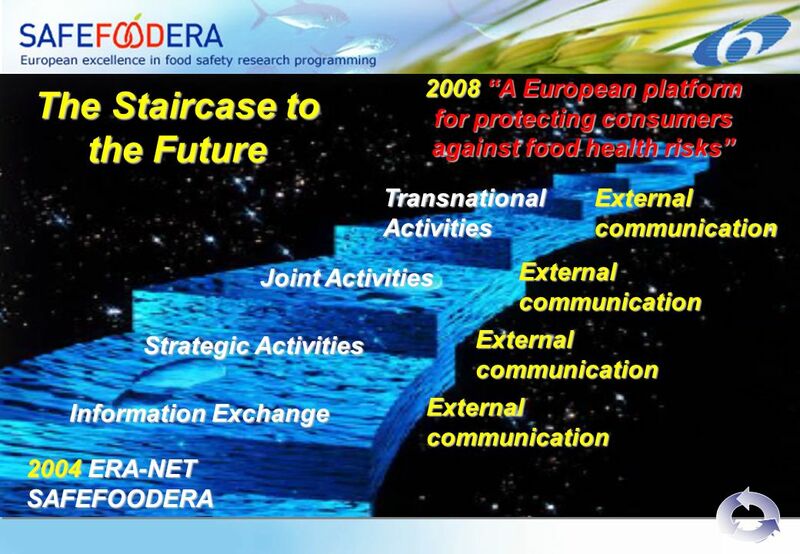 SAFEFOODERA Stakeholder meeting with Consumer groups Brussels, 15 – 16 March 2007. 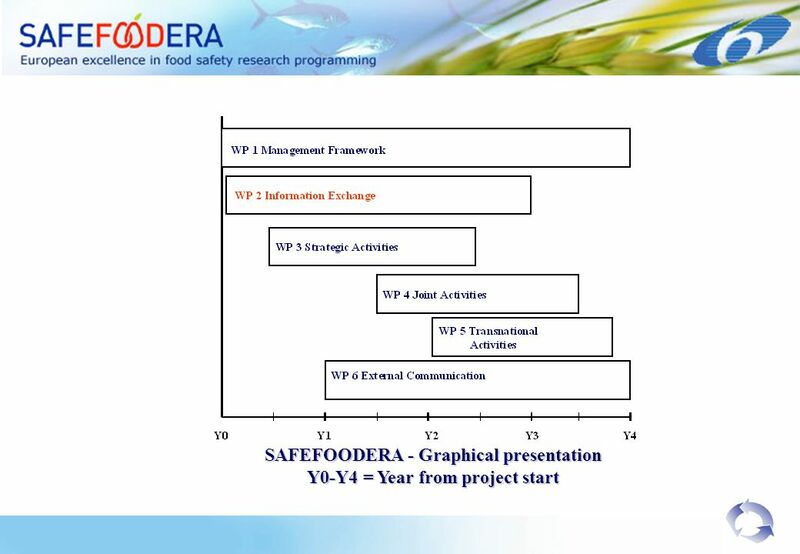 SAFEFOODERA Stakeholder Group meeting with Food Service Sector Ljubljana, February 2007. 1Bringing solutions home: Defining the scope for an action plan February International Organization for Standardization. 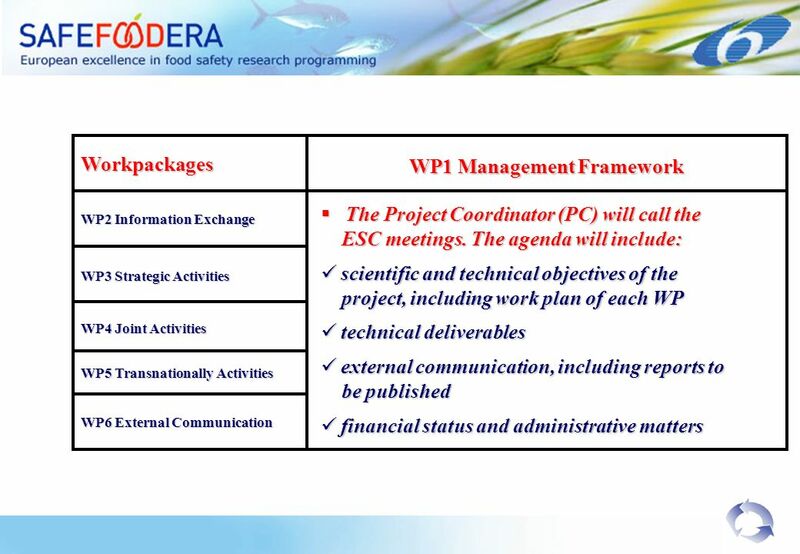 Research Infrastructures WP 2012 Call 10 e-Infrastructures part Topics: Construction of new infrastructures (or major upgrades) – implementation. 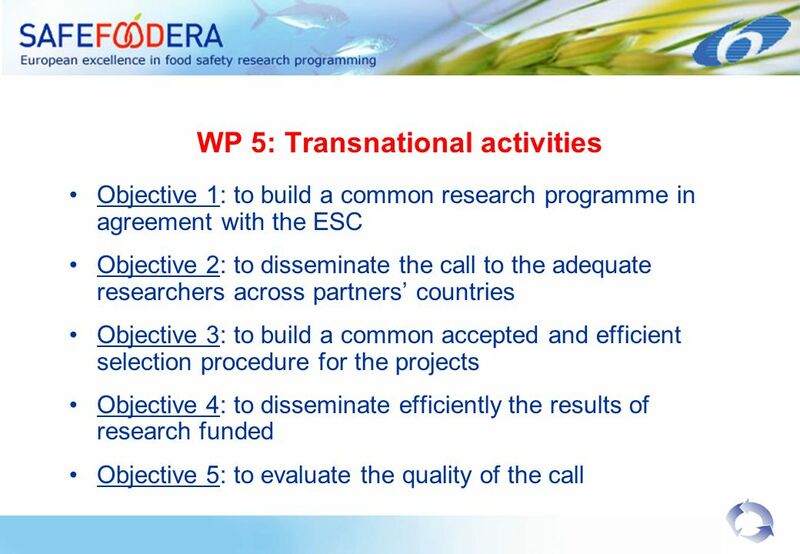  the creation of an "internal market" in research (free movement of knowledge, researchers and technology)  the restructuring of the European research.